●Leather Journal: Made of high quality PU leather,soft in hands,durable for travel or outdoor adventure.Both cover and insert work to give you a permanent memory. ● 200 pages thick paper. ● 25% heavier paper than other leading brands. ● 100-gsm acid-free/archival paper preserves your work. ● For planning, designing, sketching, and creating charts and graphs. ● Ideal for bullet journaling and other dynamic note-taking methods. ● Inside back cover pocket holds notes, business cards, etc. ● Elastic band attached to back cover keeps journal closed. ● Ribbon bookmark keeps your place. ● Notebook is a classic A5 size (5-3/4 inches by 8-1/4 inches). 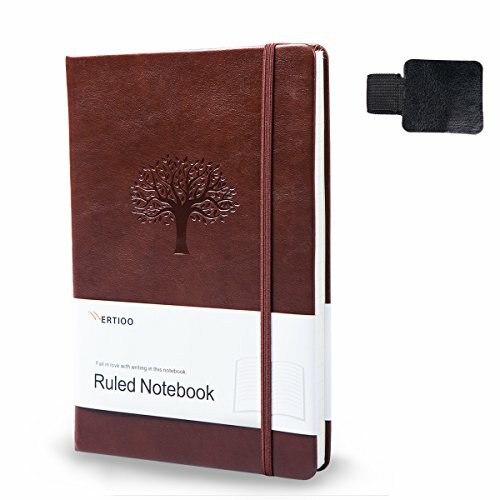 THICK PAPER JOURNAL - WERTIOO Classic notebook choose high quality acid free writing paper. Which is environmental, has no fluorescer, can effectively protect your eyesight. The paper 20%-50% thicker and smoother than normal, suit for most pens. FUNCTIONAL & STYLISH NOTE BOOK - 200 pages thick paper + Expandable Pocket + Elastic Closure STRAP +Pen Holder+ Colored Ribbon. Durable soft leather hardcover with great color combinations will give your journal a distinctive look from standard journals. Dimensions: 8.4 x 5.7 in. PERFECT as travel note book, business Journal, teen journals, back to school gift. Let your creation more freedom on the wide ruled journal to write in.Come with exquisite package, a perfect Birthday gift, Halloween gift, Christmas gift for yourself, families and friends. SATISFACTION GUARANTEED - Fall in love with this hardcover note book! If you don't, return it and receive a full refund, no questions asked! If you have any questions about this product by WERTIOO, contact us by completing and submitting the form below. If you are looking for a specif part number, please include it with your message.